The use of prefilled syringes for biopharmaceutical molecules as well as small molecules continues to be an ideal standard for unit-dose medication. The development of biotechnology drug products using prefilled syringes (PFS) continues to rise rapidly with the advantages including patient self-administration, accuracy in dosing, reduction of dosing errors, patient compliance in dosing, low overfill, safety, and convenience. This article addresses the design of a new commercially available polymer-based prefillable syringe with enhanced performance features when combined with complex biopharmaceutical drug products. The design considerations discussed include consistent glide force, low probability for drug degradation, higher material strength, and excellent barrier properties. Prefillable syringe systems need to accommodate various rigid internal and external requirements and functionalities as a container for biopharmaceutical drugs. Optimal requirements include container closure integrity, strength, consistent plunger gliding forces, and low reactivity to the drug products. In general, two main materials for PFS are glass and polymer. Polymer-based PFS can be made from various materials, including polypropylene (PP), polycarbonate (PC), olefin polymer (COP). The choice of material is related to patient use and drug product requirements for permeability or container reactivity. In developing PFS systems, the elastomer selection and surface treatments must also be considered. Biopharmaceutical drug products are often sensitive to aggregation and oxidation. Aggregation of therapeutic proteins is one of the most critical risk factors among all concerns as it may negatively impact the drug efficacy and safety due to the protein degradation which may trigger immune responses by patients. For example, the degradation by neutralized antibody of epoetin-alpha makes endogenous erythropoietin less active, resulting in an increased incidence of antibody-mediated pure red cell aplasia (PRCA).2,3 In 2014, the FDA published the guidance for industry entitled Immunogenicity Assessment for Therapeutic Protein Products, recommending minimizing any aggregation risks.4 Section V.B.8 from the guidance provides recommendations on container closure considerations. Generally, glass PFS were developed for small molecules. Thus, many potential quality issues appeared only when introducing therapeutic proteins into a PFS system. In general, there are three main design attributes for a PFS system for use with biopharmaceuticals: (1) Silicone oil-free system, (2) Material selection for low reactive containers, (3) Understanding the barrier properties. 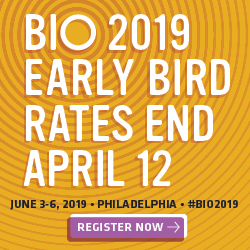 In the following sections, we will discuss the development of a polymer-based PFS that overcomes the challenges presented by biopharmaceutical drug product. There are many reports for protein aggregation, as previously discussed, as well as the presence of subvisible particles and their interactions for biopharmaceutical drug products.13-16 Increased scrutiny by regulatory agencies has also heightened the concern of the impact of aggregation and particulates on drug products. Thus, a silicone oil-free PFS system is a preferred design choice to avoid these problems.8,16-19 To address and mitigate potential issues, a silicone oil-free PFS system was developed based on a plunger stopper combined with a specific coating technology. Terumo® launched its first silicone oil-free system (product name: MINOFIT) with a polymer-based PFS in 2005. Following the success of the MINOFIT silicon oil-free PFS, Terumo continued to research and develop improvements to the coating method and created an improved lubricious coating. This coating is a strong, flexible, and uniform layer of silicone resin created through a chemical process including polymerization of the layer that is tightly bonded to the elastomer substrate. This coating was launched as i-coatingTM technology. 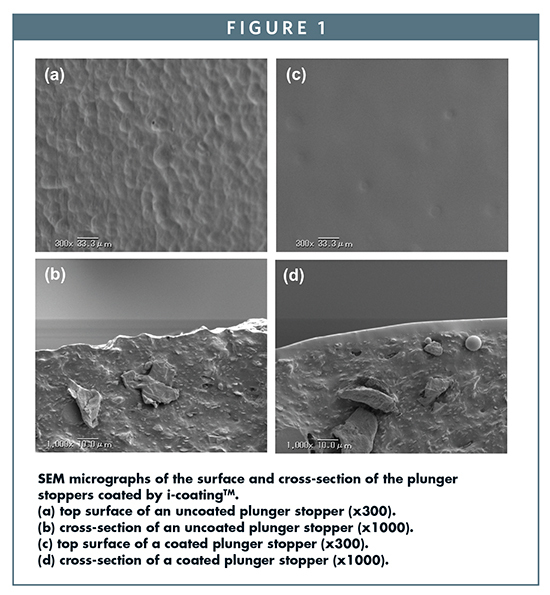 Additional properties have been presented in a published article, Functional evaluation and characterization of a newly developed silicone oil-free prefillable syringe system.18 Scanning electron microscope (SEM) images for before and after i-coating treatment are shown in Figure 1. A polymer-based PFS (PLAJEXTM) was developed by Terumo with a specific focus on biopharmaceuticals as a better choice when compared to glass PFS to resolve problems like protein aggregation or breakage. PLAJEX is made of cyclo-olefin polymer (COP), which features outstanding properties, such as impact resistance, superior moisture-barrier, and excellent transparency. Moreover, the risk of protein aggregation (due to interactions with the tungsten and glue) was reduced by insert molding the cannula. The stopper of PLAJEX has i-coating technology, which provides an entirely silicone oil-free syringe system. In addition, autoclave sterilization for PLAJEX reduces the risk of protein oxidation from radicals, which are usually generated from sterilization by irradiation. Therefore, PLAJEX is an integrated approach providing an excellent combination of properties, such as high transparency, superior strength, and smooth and controllable plunger gliding properties, as well as minimal risks of protein aggregation and protein oxidation. These features are summarized in Figure 2 and discussed further hereafter. Flange breakage force (all flange) was measured by universal tensile tester at a stroke rate of 50 mm/min between glass and PLAJEX syringes. The comparison between their strength is shown in Figure 3. 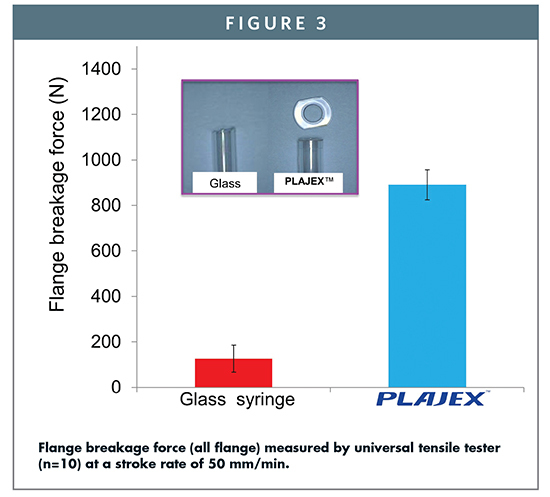 It was found that the flange of PLAJEX is stronger than that of a typical glass syringe by many-fold (Figure 3). This aspect is very useful when a syringe is used with autoinjectors, in terms of functionality under high forces due to viscous drug products. As discussed earlier, PLAJEX with i-coating technology is a silicone oil-free system. 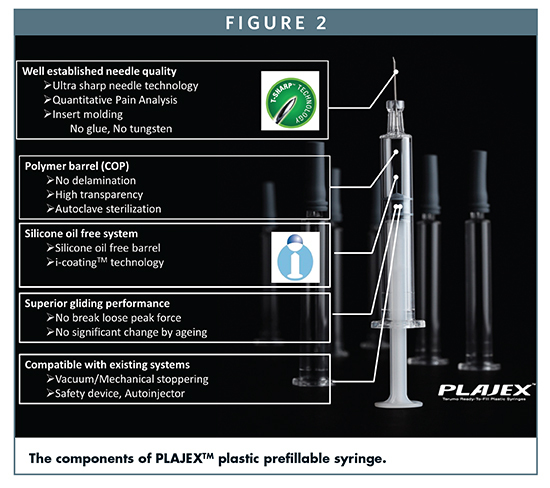 Figure 4a shows the comparison of gliding properties between traditional silicone oil-coated syringes (SO) and PLAJEX, which is a silicone oil-free syringe (SOF). The data was collected at a stroke of 200 mm/min. Glide forces were measured with a universal tensile meter. 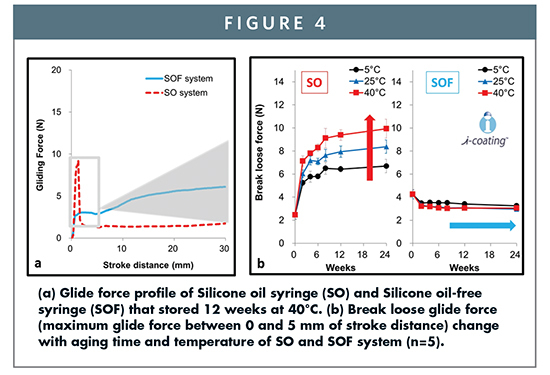 In the case of SO syringe, the silicone oil layer between barrel and plunger stopper may vary over time, resulting in variations in initial gliding force (break loose force), which increased over time by aging. For the SOF syringe, no change is observed by aging and at various temperature conditions as shown in Figure 4b. Break loose glide force is the maximum glide force between 0 and 5 mm of stroke distance. Data are presented as mean ± standard deviation (n=5).The surface layer of i-coating plunger stopper is a silicone resin that is bonded directly to the stopper material. The absence of break loose peaks is very beneficial for applications with autoinjectors for consistent performance and functionality for a given spring force. A comparative study on protein aggregation from silicone oil interactions was conducted with L-asparaginase. Lasparaginase is highly susceptible to silicone oil and forms aggregates from its interaction with silicone oil. Thus, it was used as a model protein in this study. Protein aggregation and subvisible particles were analyzed by Micro Flow Imaging (MFI). The sample was prepared using 0.5 mL of WFI and model protein solution (protein) filled into SO and SOF systems, and the syringes were shaken for 30 min at 250 rpm. 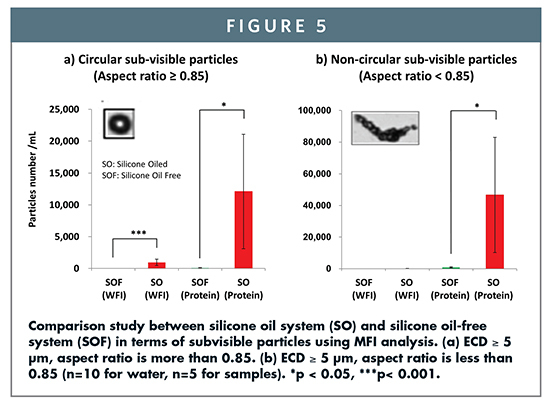 Figure 5a shows the quantification of circular subvisible particles representative for silicone oil, and Figure 5b shows the quantification of non-circular subvisible particles representative to protein aggregation. In the case of WFI, the number of circular subvisible particles increased in silicone oil-coated syringes. In contrast, this phenomenon was not observed with SOF syringes due to the lack of presence of silicone oil droplets. Thus, it can be stated that minimal protein aggregation and subvisible particles were observed with the PLAJEX SOF syringe with i-coating technology. The technologies to minimize the risk of protein aggregation by minimizing subvisible particles and other quality aspects, for example, container breakage, were discussed in earlier sections. The following sections will focus on the technologies to minimize the risk of protein oxidation. Terminal steam sterilization is frequently used for low molecular weight drug in PFS. 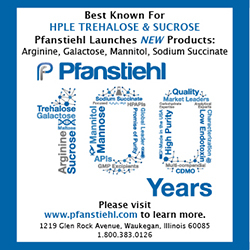 It is known that biotherapeutic drug products are sensitive to denaturation by heat, thus aseptic filling into presterilized PFS is common. The impact of sterilization on a drug is an important aspect when choosing a method of sterilization. In this study, polymer-based PFS were filled with erythropoietin (EPO) aqueous solution and sterilized by gamma irradiation and steam sterilization, respectively. The measurement was performed by HPLC. 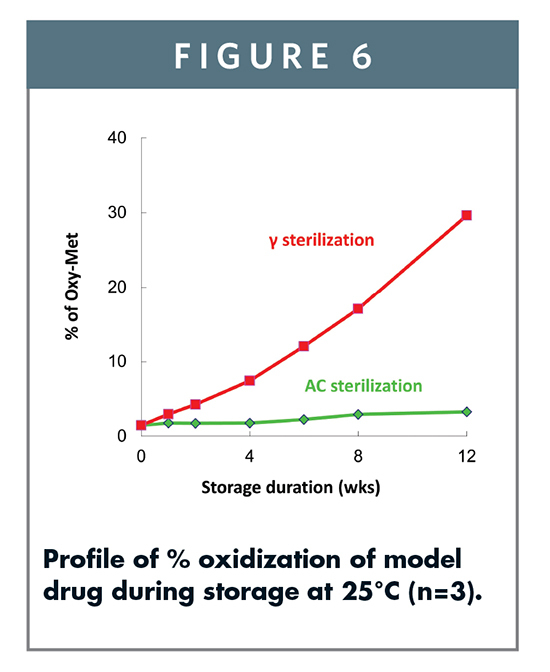 Figure 6 shows the comparison in the percentage of oxidization of methionine during storage for gamma-sterilized polymer syringes and steam-sterilized PLAJEX products. ​It was observed that polymer PFS sterilized by gamma irradiation enhanced the methionine oxidation of the biopharmaceutical drug products over time. For PLAJEX (sterilized by autoclaving), the methionine oxidation was not induced. Though more detailed mechanistic studies are underway, we assume that free radicals were generated by gamma sterilization and remained within the polymer material causing the oxidation of biopharmaceuticals, where the autoclave steam sterilization method did not generate any free radicals.16,21,22 On the basis of these results, it is evident that steam sterilization is more appropriate for polymer-based PFS for biopharmaceutical drug products. In general, biological drug products are vulnerable to oxidation. For sensitive protein applications, nitrogen control and nitrogen blanketing is necessary in all processes, such as drug solution preparation, filling, and stoppering to eliminate the risk of dissolved oxygen into the filled syringe. In the packaging of PLAJEX, the polymer permeability characteristics can be leveraged to create an advantage of a reduced oxygen environment. It is feasible to eliminate dissolved oxygen using an oxygen absorber inside the secondary sealed blister packaging along with the filled PLAJEX. This reduction in dissolved oxygen is shown in Figure 7. Dissolved oxygen was measured by OXY-4 (PreSens). When an oxygen-absorber material was used with PLAJEX, the concentration of dissolved oxygen decreased rapidly just after packaging and continued to decrease gradually. After 8 weeks, the concentration of dissolved oxygen became close to zero. 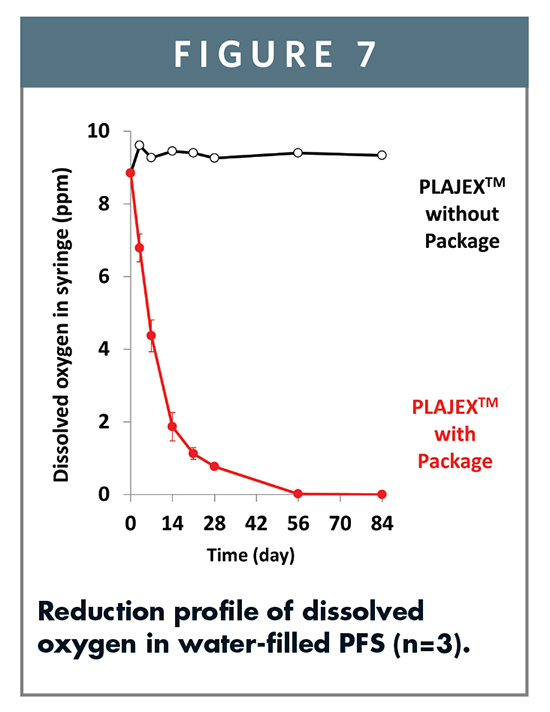 This result shows that the combination of PLAJEX, the deoxygenated package system, and oxygen absorber can prevent protein oxidation.21 Ideally, the oxygen absorber can be sized to reduce the package to a known concentration (25%, 50%, or 100%) as required by the stability of the drug products. This article shows that Terumo’s polymer-based PFS system, PLAJEX, offers several advantages for the delivery of biopharmaceutical drug products. This system was developed by combining specific features of a COP syringe with i-coating technology to deliver a SOF syringe system for low reactivity. This focus on system design provides a container that offers improved container closure system characteristics, including strength, low reactivity, reduced drug degradation, good barrier properties, and novel techniques to control oxidation. The global biopharmaceutical market continues to grow at a healthy pace along with the increase in chronic diseases, an aging global population, novel drug discovery, and improvement of healthcare efficiencies worldwide. The development and adoption of PLAJEX with i-coating technology by Terumo ensures that important biopharmaceutical therapies can be safely administered, minimizing medical errors, contributing effectively to the needs of patients, healthcare workers, and the global pharmaceutical industry. 1. The Prefilled Syringes Market. 2015-2030. Opportunities, challenges, strategies, and forecasts. SNS Research. 2015. 2. Casadevall N, Nataf J, Viron, B, et al. Pure red-cell aplasia and antierythropoietin antibodies in patients treated with recombinant erythropoietin. N Engl J Med. 2002;346(7):469-475. 3. Gershon SK, Lukskenburg H, Cote TR, et al. Pure red-cell aplasia and recombinant erythropoietin. N Engl J Med 2002;346(20):1584-1586. 4. US Food and Drug Administration. Immunogenicity Assessment for Therapeutic Protein Products. 2014. 5. Jones LS, Kaufmann A, Middaugh CR. Silicone oil induced aggregation of proteins. J Pharm Sci. 2005;94(4):918-927. 6. Mahler HC, Wolfgang F, Grauschopf U, et al. Protein aggregation: pathways, induction factors and analysis. J Pharm Sci. 2009;98(9):2909-2934. 7. Wang W, Nema S, Teagarden D. Protein aggregation-pathways and influencing factors. Int J Pharm. 2010;390(2):89-99. 8. Krayukhina E, Tsumoto K, Uchiyama S, Fukui K. Effects of syringe material and silicone oil lubrication on the stability of pharmaceutical proteins. J. Pharm Sci. 2015;104(2):527-535. 9. Mensch C, Davis CD. Inhibition of Tungsten-induced protein aggregation by cetyl trimethyl ammonium bromide. PDA J Pharm Sci Technol. 2012;66(1):2-11. 10. Seidl A, Hainzl O, Richter M, et al. Tungsten-induced denaturation and aggregation of Epoetin Alfa during primary packaging as a causé of immunogenicity. Pharm Res. 2012,29(6):1454-1467. 11. Liu W, Swift R, Torraca G, et al. Root cause analysis of Tungsten-induced protein aggregation in pre-filled syringes. PDA J Pharm Sci Technol. 2010;64(1):11-19. 12. Jiang Y, Nashed-Samuel Y, Li C, et al. Tungsten-induced protein aggregation: solution behavior. J Pharm Sci. 2009;98(12):4695-4710. 13. Singh SK, Afonina N, Awwad M, et al. An industry perspective on the monitoring of subvisible particles as a quality attribute for protein therapeutics. J Pharm Sci. 2010;99(8):3302-3321. 14. Ripple DC, Dimitrova MN. Protein particles: what we know and what we do not know. J Pharm Sci. 2012;101(10):3568-3579. 15. Bee JS, Goletz TJ, Ragheb JA. The future of protein particle characterization and understanding its potential to diminish the immunogenicity of biopharmaceuticals: a shared perspective. J Pharm Sci. 2012;101(10):3580-3585. 16. Forster R. Plastic container development for biological parenterals. PDA Annual Meeting 2013. 17. Majumdar S, Ford BM, Mar KD, et al. Evaluation of the effect of syringe surfaces on protein formulations. J Pharm Sci. 2011;100(7):2563-2573. 18. Yoshino K, Nakamura K, Yamashita A, et al. Functional evaluation and characterization of a newly developed silicone oil-free prefillable syringe system. J Pharm Sci. 2014;103(5):1520-1528. 19. Depaz RA, Chevolleau T, Jouffray S, et al. Cross-linked silicone coating: a novel prefilled syringe technology that reduces subvisible particles and maintains compatibility with biologics. J Pharm Sci. 2014;103(5):1384-1393. 20. Reynolds G, Paskiet D. Glass delamination and breakage. BioProcess International. 2011;9(11):52-57. 21. Nakamura K, Abe Y, Kiminami H, et al. A strategy for the prevention of protein oxidation by drug product in polymer-based syringes. PDA J Pharm Sci Technol. 2015;69:88-95. 22. Nakamura K, Kiminami H, Yamashita A, et al. Assessment of the effects of sterilization methods of protein drug stability by elucidating decomposition mechanism and material analysis. Int J Pharm. 2015;484:51-56. 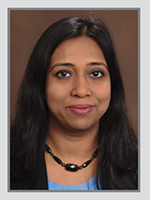 Dr. Sagarika Bose earned her PhD in Pharmaceutical Science, specializing in novel polymer coating technologies and statistical data modeling and analysis from University of Connecticut. She is the Senior Manager in Technology Development at Terumo Medical Company, responsible for the development of drug-device combinations using prefilled syringes to pharmaceutical partners by supporting their quality, manufacturing, and regulatory needs for combination devices. She started her industrial career at Wyeth Pharmaceuticals, followed by Pfizer and Endo Pharmaceuticals. She held the position as the Director, Product development and CMC in Research and Development at Amarin Pharmaceuticals prior to her career at Terumo. She has been a reviewer for several pharmaceutical journals. E: sagarika.bose@terumomedical.com; T: (732) 412-4122. Kevin Constable leads the Technology Development team for Terumo’s Global Pharmaceutical Solutions Division, providing drug & device solutions to the pharmaceutical industry. Prior to Terumo, Mr. Constable was employed by Pfizer working in the vaccines/biotechnology sector, supporting technology transfer, risk mitigation of supply, improved process solutions for filling and packaging, global harmonization of practices for aseptic filling, and packaging of prefilled syringes and vials. 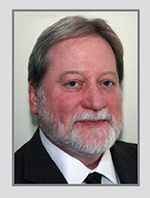 Mr. Constable has over 20 years in the pharmaceutical industry. E: Kevin.constable@terumomedical.com; T: (732) 412-4160.